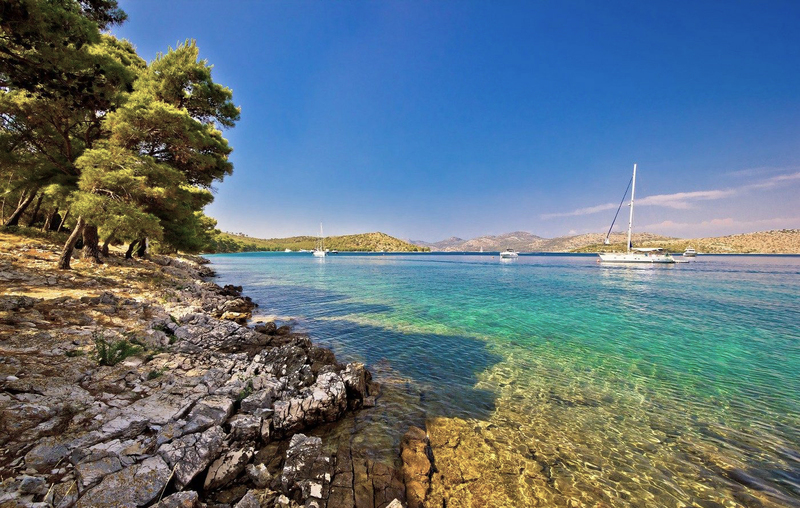 With a pleasant and sunny Mediterranean climate, calm crystal clear waters and friendly winds, the Kornati Islands are one of the best destinations for sailing in Croatia and even in the entire Mediterranean. In the Kornati archipelago you will discover deserted islands just for yourself where you can anchor your boat and enjoy some of the most beautiful beaches of the Croatian coast. The Kornati islands are formed by more than 140 islands and islets, most of them uninhabited. This makes this archipelago the perfect destination for those seeking a relaxing sailing island hopping holiday in Croatia, either with their family or friends. 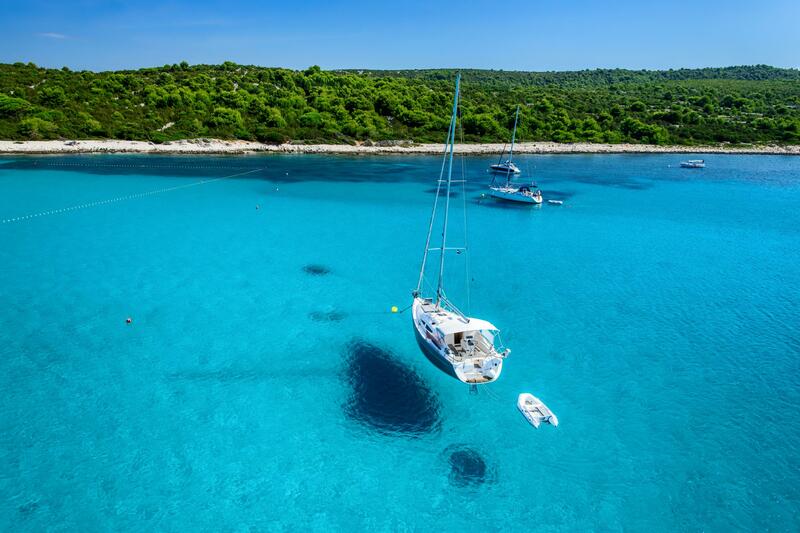 Sailing in the Kornati Islands is an unforgettable experience for sea and nature lovers. The archipelago has two national parks waiting to be discovered: Kornati, around the island of Kornat and Telascica in the island of Dugi. The islands are full of countless paradisiacal beaches where you can get lost, discover charming small towns and enjoy the exquisite croatian cuisine. Is there a better way to explore some of the most beautiful islands in Croatia than by boat? If you are planning to visit Croatia by boat to enjoy a week holiday on the Dalmatian coast, keep on reading, because we are going to tell you which are the most beautiful islands, the most spectacular bays and beaches as well as the most hidden corners of Croatia in a 7 day sailing itinerary around the Kornati Islands. At Yanpy, we are experts in boat rentals in Croatia. We have more than 1,000 rental boats of all kinds at the main destinations of the Dalmatian coast. So, if after reading this post you are determined to live a boating experience in Croatia, do not hesitate to contact us. The Kornati archipelago is located in northern Dalmatia, south of Zadar and west of Šibenik. The only possible way to visit the Kornati Islands is by boat. Biograd na Moru, in the county of Zadar is the nearest port of entry. The fastest and easiest way to get there is by plane to the international airports of Zadar or Split. From Zadar there are about 30km by car to Biograd. You can also sail from other marinas located in the cities of Zadar, Sukosan, Sibenik or Murter. Do not forget that before travelling to the Kornati it is necessary to get tickets for their natural parks. These can be purchased at Biograd, Murter, or directly by contacting the park staff. HINT: Although only takes about 30 minutes by road from Zadar to Biograd, you might prefer to rent a boat in Zadar and depart from there, adapting the route at your convenience. The Adriatic Sea is famous for its intense blue and the incredible clarity and calmness of its waters. 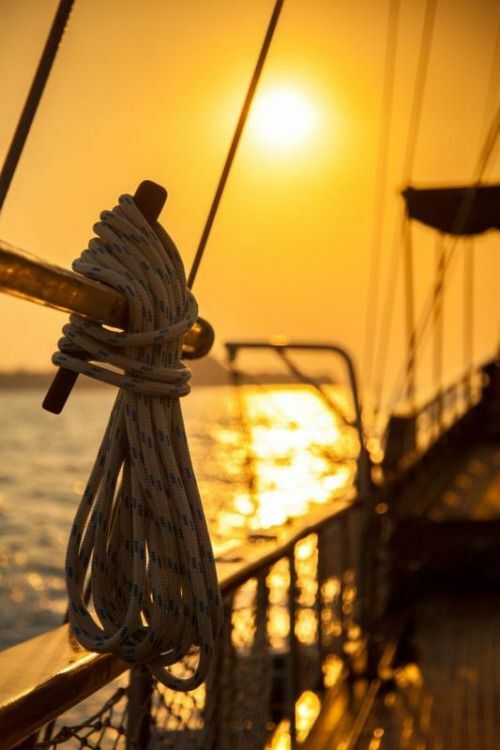 The best time to sail for a week in the Kornati Islands is from April to September. During these months a warm climate, gentle winds and a calm sea will make your sailing trip in Croatia an unforgettable experience. DO YOU FEEL LIKE SAILING AROUND THE KORNATI ISLANDS? Our starting point is the sophisticated marina Kornati in Biograd. After provisioning and checkin our yacht charter, it's time to set sails. 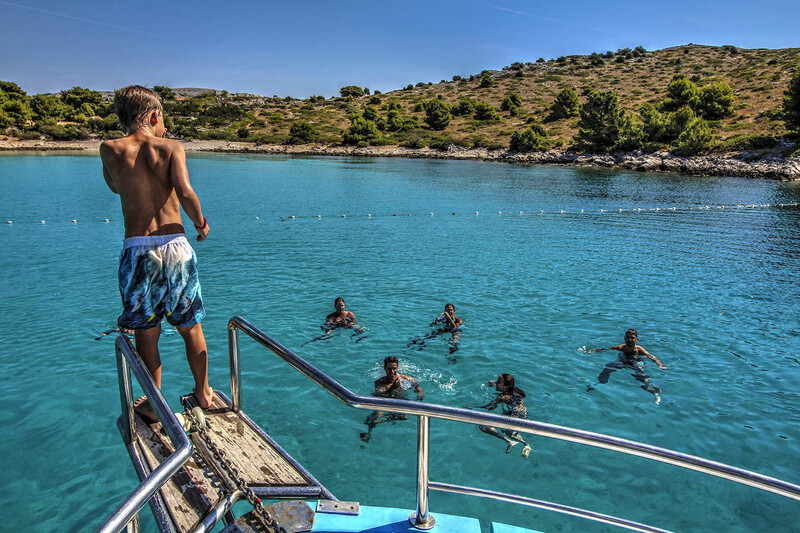 Your boating vacation to the Kornati Islands has just begun. Remember that the vast majority of charter boats in Croatia are rented from Saturday to Saturday and checkin is between 17:00 and 18:00. The first afternoon we will enjoy a relaxed sailing trip to the island of Zut ( Otok Zut), the second largest island of the Kornati. Zut is an island practically uninhabited except for the marina staff and a couple of restaurants. The island hides some of the most beautiful beaches of Kornati, and is great to enjoy a relaxing day on our boat and its crystal clear waters and exuberant nature. There are several possibilities for anchoring the boat. The ACI Marina Zut is located at the western end of the island and has restaurants and supermarkets. Another highly recommended option is to anchor in the bays of Luka Zut or Hiljaca on the northeast coast. These bays are offer good shelter and will allow us to enjoy a quiet dinner on board under the light of thousands of stars. The sun rises in Zut. We have a beautiful day ahead full of adventures to sail in Croatia and discover some of the most beautiful places of the Kornati Islands. Our boat will head to the island of Dugi (Dugi Otok), the largest island of the Kornati archipelago, where we will spend the night. It is the perfect island to escape civilization, enjoy nature and its spectacular crystal clear waters coves. During the trip we will cruise along the east coast of the island passing through Sali, a charming fishing village where we can rent a bicycle, a motorcycle or even a car to discover the hidden treasures of the island. Sali is very well connected to the rest of the island and offers services that you will not find in the rest of towns, such as a supermarket, a bakery and some restaurants. In the afternoon we continue with our trip sailing between Rava and Otok Iz. If you have rented paddle surf boards, it is a good time to practice the sport whilst exploring with the family one of the bays of the island of Rava or the beautiful Brbiscica bay and its impressive underwater cave in Brbinj. At sunset, we arrive at Dragove, one of the coastal towns of Dugi Otok where we can anchor and enjoy a quiet dinner on the boat. Do not forget to visit the bunker! Today will be a special day on our sailing trip in Croatia. We will sail around Dugi Otok to discover two of the most famous sights of the Kornati Islands, Veli Rat and the spectacular Sakarun beach (also called Saharun). Veli Rat is one of the most famous villages of Dugi Otok for its beautiful beaches and for having one of the highest lighthouses of the Adriatic where you can even spend the night. From there we border the northern tip of the island until we reach the Sakarun beach, considered the pearl of Dugi. Certainly, this bay of Kornati has earned its reputation thanks to its incredible white sands and its stunning crystal clear waters. A mandatory stop during this sailing week in Croatia and the Kornati Islands. Explore this little piece of paradise, swimming with your family or friends and do not forget to take a selfie, your friends will be super jealous. Your boat vacation in the Kornati are unforgettable. 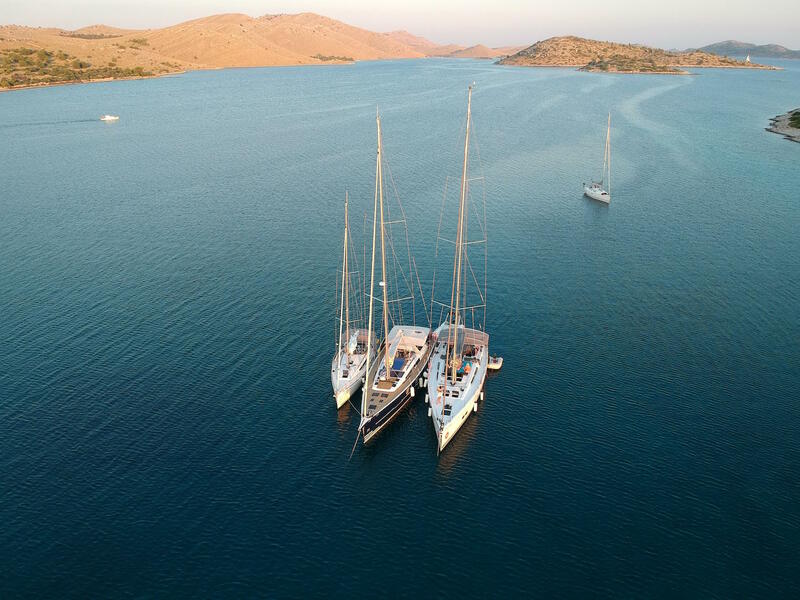 Want to find a yacht to sail around The Kornati Islands? HINT: During our day boat, if we feel like visiting a new island, we can visit Molat. You will discover that like most of the Kornati islands, Molat is a pristine island, brimming with nature. In Molat you can get away from the noise and the crowds and enjoy a true mediterranean atmosphere of peace and calmness. We are halfway through these 7 days boat vacation in the Kornati Islands. Today is going to be the longest sailing day. 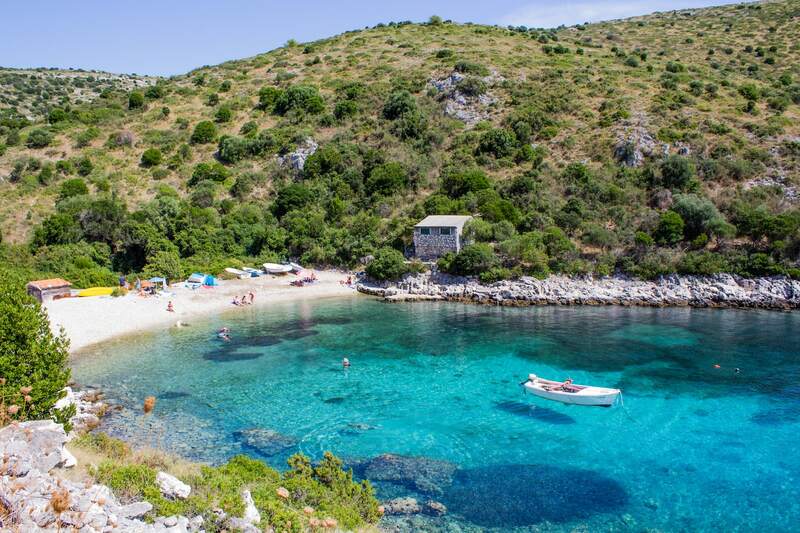 We will sail the island of Dugi, from the beach of Sakarun to the Natural Park of Telascica. We will sail guarded by the imposing Stene cliffs, which reach a height of up to 200m. Keep your eyes open, it is easy to receive the visit of friendly dolphins. Yes, you are right, sailing in Croatia is a spectacle for the senses. The natural park of Telascica is the perfect option for hiking and exploring its mediterranean forests, swimming in its spectacular salt lagoon and enjoying some of the incredible beaches it hides. It is a very quiet place with hardly any tourists and where to connect with nature is very simple. A mandatory stop is Lake Mir. It is separated from the sea by a thin surface of land and is surrounded by lush green vegetation in a mountainous landscape. The salinity of Lake Mir is greater than the open sea due to evaporation. Also, a curious fact, its waters in summer are warmer than the sea, and in winter, colder. 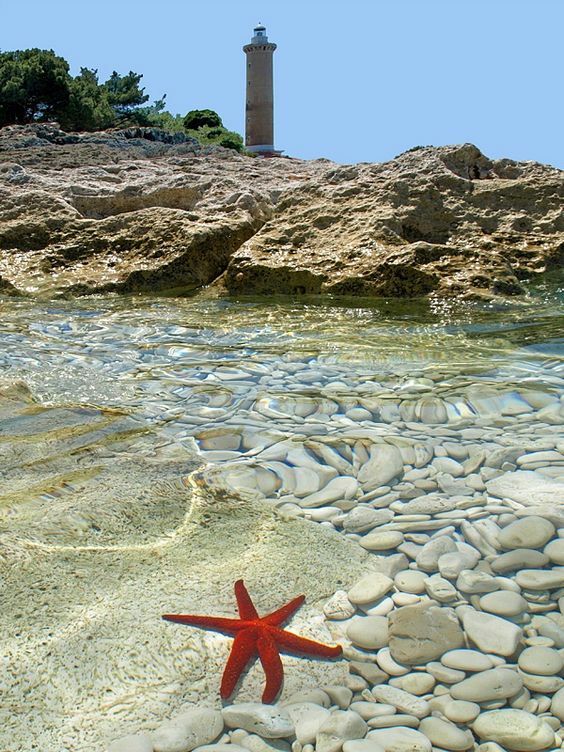 The bay of Telascica is undoubtedly one of the most beautiful and protected natural harbors of the entire Adriatic. HINT: Discover the ruins of the picturesque island of Katina, and if you fancy a dinner on land, you can enjoy a good fresh grilled fish and seafood both at the Mare restaurant and at the Konoba Suha Punta on the neighbouring island of Kornat. We start to make our way back! Today we will sail along the west coast of the island of Kornat (Otok Kornat). Its incredible natural landscapes will take your breathe away as its imposing cliffs, such as Otok Klobucar which is 82 meters high, the highest on the island. The natural park of Kornati consists of more than 80 islands, most of them uninhabited. So, today is the perfect day to relax sunbathing while you hop from island to island. It's time to take a dip with your family or friends. The beautiful beach of Lojena on the island of Levrnaka, is a perfect choice. The crystal blue of its waters will leave you speechless. Are you hungry? Its restaurant offers fresh grilled fish and seafood that will delight the most demanding palates. Dive into the stunning Otok Lavsa and discover its rich marine life, one of the main reasons why Kornati is a natural park. At dusk, organize a trip with your family and conquer the top of any of its islands. You will have earned the right to enjoy the sunset on the Kornati Islands, one of the most beautiful sunsets in the world. To close a perfect day, look for a quiet bay in one of the islands further south of Kornati, such as Smokvica Vela where you can anchor. One of your last sailing days in the Kornati Islands in Croatia has simply been unforgettable. Your boat holidays in Croatia are coming to an end. During this sixth day we will discover two jewels in the shape of an island in the south of the archipelago: Zirje and Kaprije. Zirje has some coves and postcard beaches, such as Stupica Bay or Koromasna Beach. If you fancy a walk, you can visit the ruins of the fortress of Zirje (Utvrda Žirje) and on the way back enjoy an excellent fish at Konoba Stupica restaurant. We can say goodbye to the incredible waters of Stupica with a refreshing swim before heading to the island of Kaprije, the final destination for the day. A curious fact: the island of Kaprije is ideal for diving enthusiasts. Its waters hide many sunken ships and every year it receives the visit of professional divers from all over the world. Enjoy this great underwater experience! At the end of the day, we savour a Croatian dinner at Kod Kate restaurant, on the island’s bay where we will spend the last night of our sailing holidays in the Kornati. Last day on board! We head north along the Croatian coast through the island of Murter. There is the possibility of going through the Tisno Bridge, a drawbridge but it only opens twice a day, at 9 o'clock in the morning and at 17 o'clock. If we want to get up a little later and relax, it is better to go around the island. On the way to Biograd we say goodbye to some of the most paradise beaches of the Kornati islands such as Slanica, or Podvrske in the island of Murter or other treasures that we will let you discover in the islands of Otočić Zminjak, Otok Radelj or Vgada. What do you think of our sailing route to the Kornati Islands?